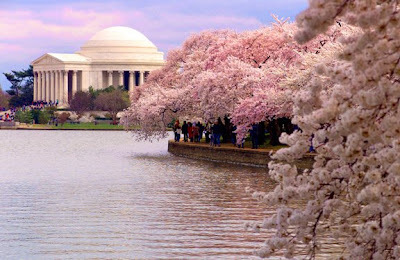 The Cherry Blossoms are at their peak in the Nation's Capital! 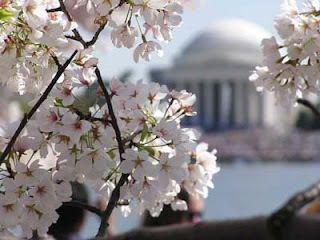 Every year, masses of blooms engulf the trees circling the Tidal Basin and other areas of the city. I visited one year when the wind and rain pasted pink petals onto everything. In celebration of the trees and their importance to the city, dozens of organizations plan festivities to coincide with the blooms. Parades, fireworks, a marathon, kimono fashion shows, martial arts exhibitions, just to name a few, are all themed to the famous blossoms. 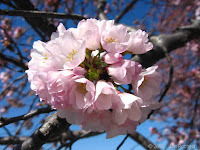 In 1912, the mayor of Tokyo donated cherry trees to commemorate the US and Japan's growing friendship. 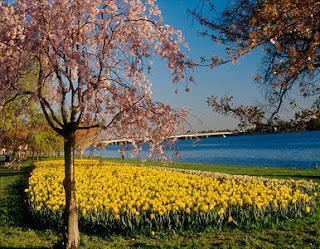 The first of these trees were planted on the banks of the Tidal Basin by then-First Lady Helen Taft, along with the wife of the Japanese ambassador. 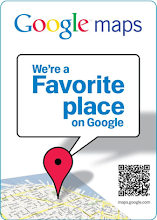 The first official festival was held in 1935, but suspended during WWII for obvious reasons. It resumed again in 1947. Since then, 3800 more trees have been planted, including cuttings from a famous tree brought from Japan, that was thoug ht to be over 1500 years old! Here's a photo from my own yard-a little cherry blossom festival among the azaleas!